ABOVE: Münster-Osnabrück Airport is served by several major airlines, and buses run from the airport to Münster's railroad station. INSET BELOW: Bike riders in Münster, which is said to be Germany's bicycling capital. Münster is in North Rhine-Westphalia, not far from Germany's border with the Netherlands. Airports. 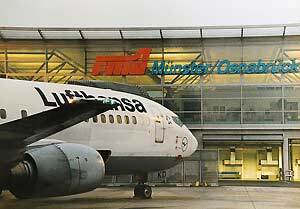 The nearest international airport is Flughafen Münster-Osnabrück (FMO) in Greven, which is 34 minutes from the Münster train station by express bus. Dortmund Airport (60 km south) and Düsseldorf Airport (120 km south) are also convenient to Münster. Verkehrslandeplatz Müenster-Telgte, just 8 km from the city, serves private pilots. Railroad. Münster is a major stop on several north-south rail lines. You can reach the city by ICE from Frankfurt Airport in about four hours. Bremen (1¼ hours) and Hamburg (2¼ hours) are even closer. From Amsteram, you can reach Münster is a little over 3 hours with a train change at Rheine. For schedules, use the interactive journey planner at www.bahn.com. Car. We haven't driven to Münster--we prefer the train--but the city's tourist office suggests "Autobahn A1/B3 (Hansalinie) exits Münster-Nord, Münster-Sud and Autobahn 43 (Wuppertal-Münster) exit Münster-Nord." Boat. During the warm months, the Santa Monika Fahrgastschiffe offer excursions between Dortmund and Münster's trendy harbor district via the Dortmund-Ems Canal. Information on the company's Web site is sketchy, so you may want to e-mail the boat line with the dates of your visit before making plans. Münster is a compact city, and you can get just about anywhere on foot. It's also a great city for bicyclists, thanks to the Promenade (the grassy park strip that encircles the old town) and Die Radstation (in English, "the Bicycle Station"), a city-owned commuter facility near the railroad station where you can rent, park, or get service for bikes. A number of hotels rent bikes to guests; look for the "Bett & Bike" icon in the city's official hotel directory. Also see the tourist office's Münster: The Bicycle City page, which has information for bicylists. The city also has an extensive bus network (see Stadtwerke Münster), but you probably won't need to use it unless you're staying on the outskirts. We wouldn't recommend driving or parking in the Altstadt, where the medieval street plan is confusing and some areas are pedestrian zones. It's much easier to park on the edge of town, along the ring roads. The Bahnhofsmission in the Münster railroad station can help with boarding, disembarking from, or changing trains, and it rents wheelchairs by the day. E-mail [email protected] for information. Also see the "Mobility Service Centre for planning barrier-free trips" section of the DB's "How to contact Deutsche Bahn" page. The local tourist office, Münster Marketing, can help you find wheelchair rentals from private firms or in the Münsterland region, suggest guided tours, and give you a city map with information handicapped car parking, special toilets, and barrier-free access to sights in the city center. A tactile map for blind visitors also was available when we last checked.